What sounds and scents and sensations fill your memories of Christmases past? *Smilax rotundifolia, known as common greenbrier, is a woody vine native to the eastern and south-central United States and to eastern Canada. Used like holly as a holiday decoration. Christmas Bells by Jennifer Chiaverini (Dutton 2015) offers parallel narratives of two people struggling with life’s challenges as the Christmas season approaches. Their stories are told in alternating chapters. Henry Wadsworth Longfellow suffers family tragedy and fear of more to come in 1863. But he manages to write a poem titled “Christmas Bells”. The modern day character, Sophia, learns she will lose her teaching position. She worries not only for herself but for the underprivileged children in the church choir she directs. Longfellow’s poem, set to music, becomes the connecting link between two lives lived in different centuries. Chiaverini’s previous works – Mrs. Grant and Madame Jule, Mrs. Lincoln’s Rival, The Spymistress, and Mrs. Lincoln’s Dressmaker – also bring to life real and fictional characters in interesting circumstances. Look carefully at this festive 1920’s Denver street scene and you will find a lighted Santa Claus with a packful of presents above the clock on the Daniels & Fisher tower. Christmas tree shapes, formed by strings of lights, are visible at the base of the tower. The massive Daniels & Fisher Department Store occupies the rest of the block. Sixteenth street is decorated with lighted ropes of evergreen stretched above the street and centered with wreaths. Today, only the tower remains. May memories of Christmases past light your holidays. When I was a child, the nativity set was the first box we brought up from the basement, long before the Christmas tree was selected and presents were wrapped. Mother cleared the lower of four shelves built into the diningroom wall. Ever so carefully, I unwrapped each figure. I arranged the shepherds and their sheep at one end and the wise men astride their camels at the other end. The centerpiece, Mary and Joseph and the baby, was carved from a piece of marble so I could not move those figures. Every day I would rearrange the shepherds and inch the wisemen closer to Bethlehem’s stable. And I moved the two angels to different locations in the tableau. Today that mismatched nativity set occupies my fireplace mantle. The mismatched figures have a few more chips and cracks but they remind me of fond Christmases past. And they still tell the same story. PEACE TO YOU AND SPECIAL MEMORIES. 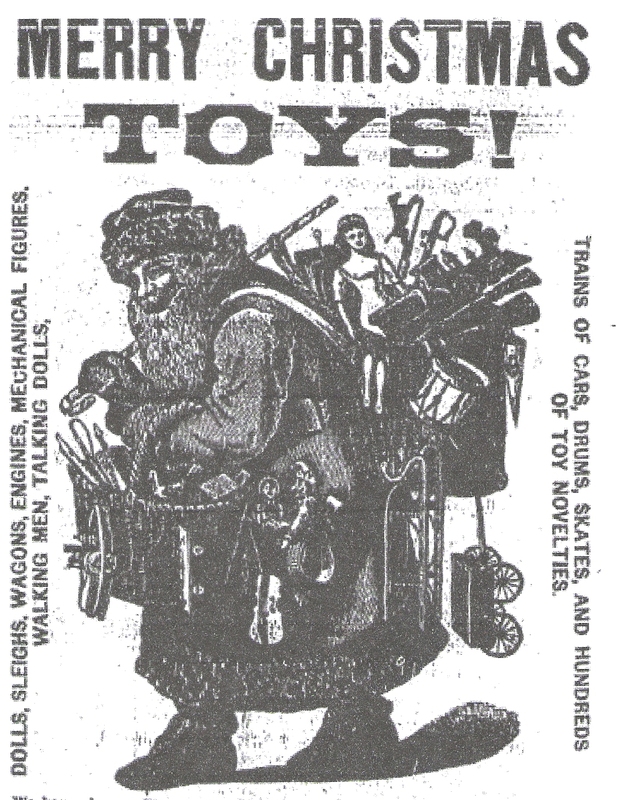 This ad appeared on the back page of the Leadville Daily Herald (Lake County, Colorado) on December 23, 1880. It probably lured many children to press their noses to the window of the Spaulding and Woodruff Store on Chestnut Street. Calling it the “Boss Toy Store,” the proprietors offered dolls, mechanical figures, walking men and talking dolls, trains, drums, skates, and wagons. For adults the store advertised gift items including Meerchaum pipes and cigar holders, moustache and fancy cups, Japanese cabinets, writing books, albums, velvet frames, fine cutlery, solid rosewood and silver maple guitars, Russian silk purses, and diaries for 1881. Other stores competed for holiday sales with ads in the same paper. Kline and Leopold, proprietors of The Chicago Novelty Store located across the street from the Tabor Opera House, captured the upper left corner of the front page. They announced the “largest line of holiday goods ever brought to Colorado, at Eastern prices.” This suggests great bargains. Although the railroad had come to Leadville, the cost of shipping goods from back East added to the cost of the items. F.W. Hurd and Company on Harrison Avenue–“Santa Claus Headquarters”–offered lots of toys plus fine stationery, paper weights, pocket books and ink stands. For Christmas dinner, Sailor & Sohl’s Market at 618 Harrison Avenue advertised fine buffalo calf, antelope and venison along with the more common ducks, geese, turkey, and chickens. 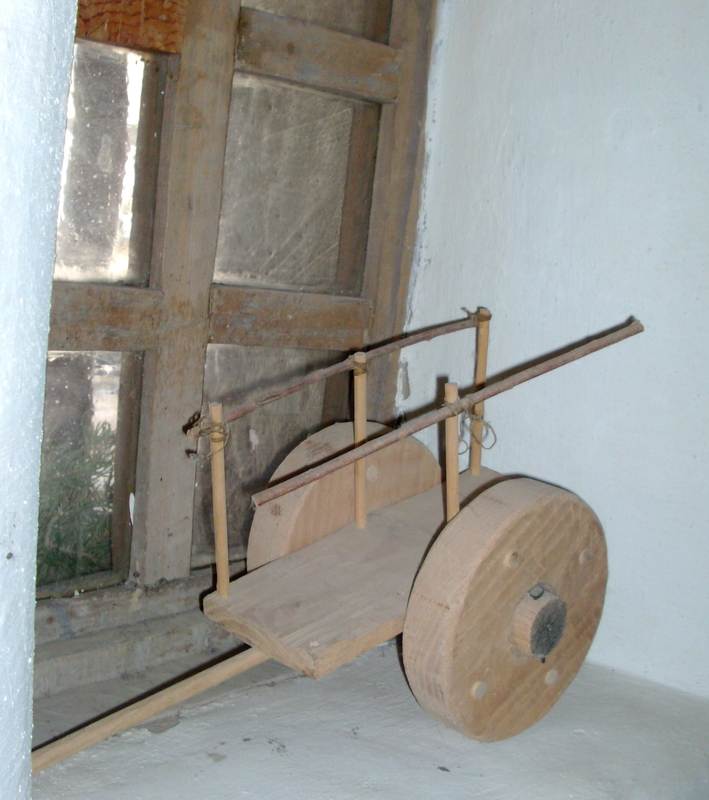 This little handmade wooden cart would have delighted a child of the Southwest in the 1800’s. I spotted it parked on a window sill at Bent’s Old Fort National Historic Site. Perhaps it was once a child’s Christmas gift. Whether you celebrate Christmas, ﻿Hanukkah, Kwanzaa, Muharram, winter solstice or other observances of the season, may you find peace and the simple joy of a child. 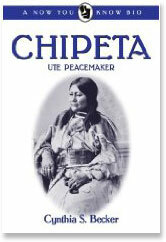 Just in time for Christmas, Filter Press announces that Chipeta: Ute Peacemaker is now available in e-book format for both Kindle and Nook. 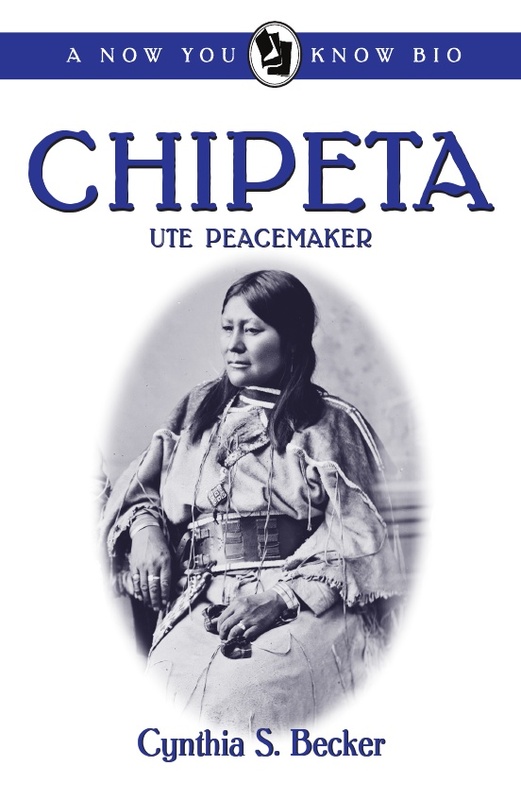 This biography of a Ute Indian woman is perfect for middle grade students or readers of any age interested in Native Americans or intriguing and courageous women. All I wanted for Christmas was a doll. I carefully printed my letter to Santa in my best first grade penmanship and licked the stamp myself. On the first day of December I rode to the post office with Daddy so I could drop my letter in the mailbox. After that, I looked over my shoulder often. Since Santa knew who had been bad or good, he must peek through windows and around corners. Being on my best behavior for a whole month was trying. Waiting for Christmas took forever. When Christmas Eve came, at last, I squirmed and fidgeted through supper. I was too excited to eat. Daddy settled me on the living room sofa and said he would read me the funnies from the newspaper. I could not concentrate. I stared out the window where snowflakes swirled in the glow of lights on the evergreen bushes. What was that? Something red moved past the bushes. I dashed across the room and pressed my nose to the windowpane. I saw nothing but snow and colored lights. I must have imagined someone was out there. Then, I heard a knock on the front door. “See who that is,” Daddy said. I stood frozen in place. Daddy hurried to the door and swung it open. “Why look, it’s Santa Claus!” he exclaimed. I ran to stand behind Daddy. Peeking out from behind his legs, I could see that it did appear to be Santa Claus, red suit, white beard, and all. Daddy invited him in. I held my breath and wadded Daddy’s pant leg in my sweaty little fist. I knew that I had better say “yes” or the next morning I would find nothing but a bundle of switches with my name on it under the tree. I tiptoed forward. Daddy whisked me onto the red knee and I was face-to-face with Santa Claus. I examined Santa up close and I wasn’t frightened any more. I answered his questions, asked politely if he had received my letter, and repeated that I wanted a doll. From his red bag he produced a neatly wrapped package that felt like a book. He assured me that he would be back later that night after I was asleep. Then with a “Ho, Ho, Ho” and a “Merry Christmas” he was out the door and off into the blustery night. Nothing Mother or Daddy said could sway me. I knew our neighbor. I talked to him often. His wife drove my school bus. Yes, it was definitely Mr. Bates. In church that night, as we sang the familiar carols and listened to the story of Jesus’ birth read from the Bible, I began to wonder. Was that really Ivan? The Santa man seemed so much bigger and he had all that white hair and beard. Sitting in the dark church I wasn’t so certain any more. I crawled into bed that night hoping to hear noises on the roof. I woke at sunrise. The only sound was Daddy’s snoring. I found my robe and furry slippers and tiptoed into the living room. Morning light frosted the dark Christmas tree. Fear and excitement battled inside me as I crept toward the tree. Halfway across the living room I stopped, wide-eyed. A beautiful doll stood in the very center of the packages beneath the tree. Every Christmas of my childhood, I went to Bethlehem. 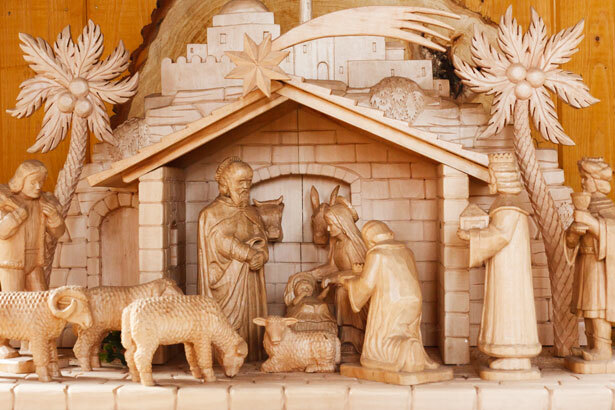 Mother began the season by bringing out the box of carefully wrapped figures for the manger scene. It was my job to arrange the figures on a dining room shelf to recreate the scene of Jesus’ birth in a Bethlehem stable. Ours was a mismatched set. The figures of Mary, Joseph and the baby were one piece, cast in a white faux marble inside an arch decorated with flowers and cherubs. It was a gift from a great-aunt and uncle. The rest of the figures were plaster painted to look like china. I spent most of an afternoon arranging and rearranging shepherds, lambs, a dog, a cow, and two angels. The three wisemen and camels I placed at a far end of the shelf and every day I moved them just a fraction closer to Bethlehem. On Christmas Eve we dressed up and bundled up to go to church. Lit only by candles in the dark window arches and on the altar, the sanctuary felt mysterious and magical. Pine boughs scented the air. People slipped quietly into pews and whispered greetings to each other. A voice from out of the darkness read the Christmas story from the King James Bible and the organist played the Christmas hymns we all knew by heart. Bethlehem Church in Evansville, Indiana was one of a string of churches built by German immigrants. We ended by singing Stille Nacht in German as we passed the flame to light our individual candles and spread a warm glow into our world. Several weeks ago, as I have done every year, I brought out the box of carefully wrapped figures. Mary, Joseph and the baby are untouched by time. The other figures are chipped and cracked. My childish artistry can be seen in eyes redrawn on an angel’s face. I arranged the figures on a new shelf and recalled my childhood wonder at the story they told. On Christmas Eve I will close my eyes and go to Bethlehem once again.